My love of needlework has always been predominately a love for embroidery. But at times you can be forgiven for thinking that quilting is taking over. In fact I love the fabric that is available in the quilt shops, and I love putting together new patchwork tops. I especially love embellishing the top with embroidery. As I was doing my 31 Days of UFOs and WIPs last January, I was surprised by the number of unfinished quilt tops and other non-embroidery projects that I was unearthing! This year, I have been more focused on my first love, but I did not want you to think that over the last 12 months I had completed all of my quilt tops! No way, not by a long shot! In this post (which should have been written last night, but I was too hot to think about it…) I am going to be focusing on my quilts. Another project that should not take too long to finish is Cinderberry Stitches “Creature Comforts”. It is hard to believe that I have not touched this sweet project for over a year. And it is predominantly embroidered too! This is most annoying. Once I have finished embroidering the centre panel, I will need to choose the fabrics that I want to use for the quilt. I am thinking of something sweet. 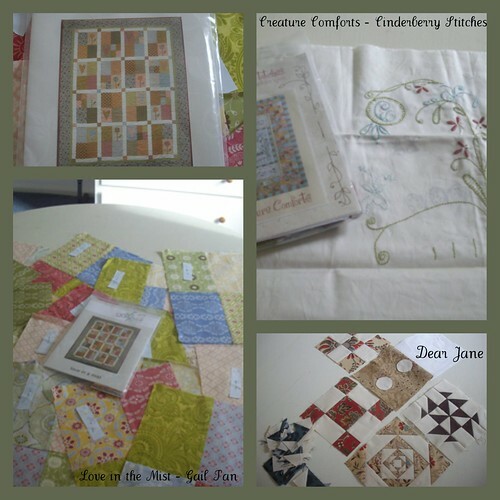 The third project that I am showcasing here this morning is my Dear Jane project. I started this project knowing full well that it was going to be a very long term project. I only work on it at my Dear Jane class, and this year I am not going to be able to attend this class as I have other commitments on the first Saturday of the Month. Although my first block was a really easy block, I have promised myself that I would not do all the easy blocks first, but try to do a variety of blocks that have a variety of difficulties, just so that I don’t feel overwhelmed with the really complicated blocks at the end. As a result of this policy, I have completed a foundation pieced block for the first time ever in the past twelve months. But don’t ask for a tutoria – I cannot remember how I did it! They have the most beautiful fabric. I plan on going back this year sometime. Thank you. I usually only get to the Tea House during the Fabric Frolic, which I missed this year, and I always aim to be there for lunch, feasting on the amazing scones, jam and cream that they make. And they also do amazing iced chocolate milk shakes.